You know how much I love to read. It opens your mind, creates great ideas and really engages you in greater thinking. 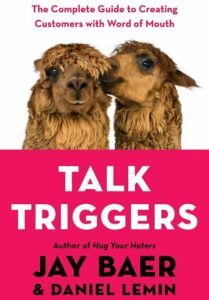 I recently had the opportunity to read a book that grabbed my attention, called Talk Triggers. Written by two ah-mazing speakers and experts in their field of powerful and relational marketing, Jay Baer and Dan Lemin, it reminds you to pay attention to your relationships and leverage referral marketing. They believe word of mouth marketing works and in their new book, launching today, they share why. They share four talk triggers in this book: being remarkable, relevant, reasonable and repeatable. There are some fantastic contextual models in this book, which you know I love! Learn more about how they book can help you by watching my book review. Finally, subscribe to my YouTube channel and connect with me on Social Media. I can be found on Twitter, LinkedIn, Facebook and Instagram.